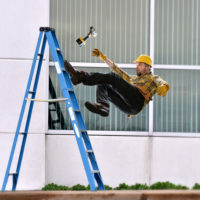 In a case coming before the New York Appellate Division First Department, a worker injured when he fell from a wobbling ladder has succeeded on a motion for summary judgment, which found the employer liable for failing to provide adequate protection of the worker’s safety. Nicholas Hill was an HVAC mechanic who worked for C & C Meats Corp., and is the plaintiff in the case titled Hill v. City of New York et al. On the day of his accident, Hill was installing a portion of an overhead refrigerator unit on the property leased by C & C Meats and owned by the City of New York. Hill was provided with a ladder to use but no safety harness to wear while on the ladder. He climbed to the sixth rung of the eight-foot ladder to tighten pipe fittings. While Hill worked, the coworker who had been in the room with Hill left to retrieve fittings from a different room. While he was gone, Hill’s ladder wobbled to the right and left, causing Hill to lose his balance and fall backward off the ladder. The owner of C & C Meats was able to watch Hill’s fall on a surveillance video after the fact, and described the ladder as wobbling to the right, then left, before Hill fell and “bounced on the ground.” The owner admitted to not providing Hill with any safety equipment that day. While C & C Meats argued that it should be held liable only if the ladder it provided to Hill was defective, the Appellate Division disagreed. The court found that Hill had to show only that “his injuries were the direct consequence of using a ladder that did not provide adequate protection.” The Appellate Division granted Hill’s motion for summary judgment on his § 240(1) claim, finding C & C Meats liable for their failure to offer safety protections while Hill worked on a ladder. If you have been injured by a ladder fall or other work-related injury in New York, contact the seasoned and dedicated Hudson Valley workplace injury lawyers at Rusk, Wadlin, Heppner & Martuscello for a consultation on your claims, at 845-236-4411 (Marlboro) or 845-331-4100 (Kingston).